Objectives: We report our experience with bilateral laparoscopic transperitoneal adrenalectomy, and evaluate the safety and efficacy of laparoscopic approach for bilateral adrenal disorders. Pateints and methods: Between March 1998 and January 2008, we performed laparoscopic adrenalectomies in 41 patients. 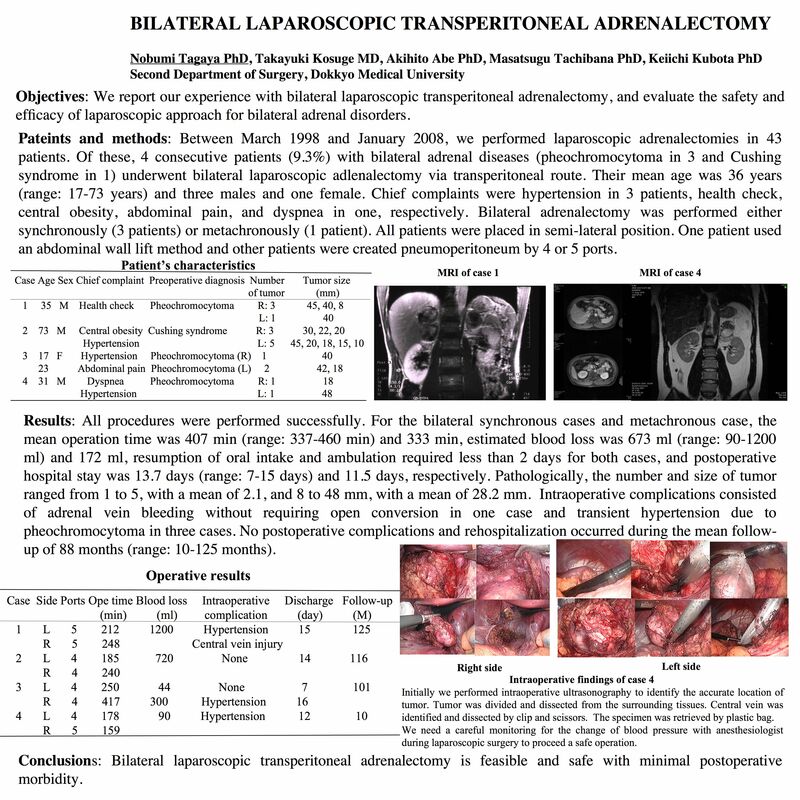 Of these, 4 consecutive patients (9.8%) with bilateral adrenal diseases (pheochromocytoma in 3 and Cushing syndrome in 1) underwent bilateral laparoscopic adlenalectomy via transperitoneal route. Their mean age was 36 years (range: 17-73 years) and three males and one female. Chief complaints were hypertension in 3 patients, health check, central obesity, abdominal pain, and dyspnea in one, respectively. Bilateral adrenalectomy was performed either synchronously (3 patients) or metachronously (1 patient). All patients were placed in semi-lateral position. One patient used an abdominal wall lift method and other patients were created pneumoperitoneum by 4 or 5 ports. Results: All procedures were performed successfully. For the bilateral synchronous cases and metachronous case, the mean operation time was 407 min (range: 337-460 min) and 333 min, estimated blood loss was 673 ml (range: 90-1200 ml) and 172 ml, resumption of oral intake and ambulation required less than 2 days for both cases, and postoperative hospital stay was 13.7 days (range: 7-15 days) and 11.5 days, respectively. Pathologically, the number and size of tumor ranged from 1 to 5, with a mean of 2.1, and 8 to 48 mm, with a mean of 28.2 mm. Intraoperative complications consisted of adrenal vein bleeding without requiring open conversion in one case and transient hypertension due to pheochromocytoma in three cases. No postoperative complications and rehospitalization occurred during the mean follow-up of 88 months (range: 10-125 months). Conclusions: Bilateral laparoscopic transperitoneal adrenalectomy is feasible and safe with minimal postoperative morbidity.